One of the simplest, yet most important things you can do when following a tipster, system or even your own betting – is to setup the right betting bank. And whilst betting banks might not be the ‘sexiest’ topic in the world, getting them setup right can make a massive difference to your betting bottom-line. In today’s email I am going to show you just how using the real-life example of the SBC Hall of Fame tipster that turned £2000 into £6,278.80 (after fees) using a betting bank. Betting banks are also hugely important as I have seen too many people lose money they shouldn’t have, simply because they didn’t set one up. And the daft thing is – they are so easy to understand and implement, that once you start working to a simple betting bank, you won’t look back! It will become your default thing to do whenever you follow a new tipster, system or method. After all anything that can help minimise losers and enhance winners has to be a good thing right? Firstly then, a short guide to what betting banks are and how they work from the point of view of following a tipster service (like the many we recommend here at SBC). Simply put, a betting bank is a set amount of money that you put aside for each tipster that you follow so as to make you the most effective return. I.e. the biggest bang for your buck! For each tipster that you follow, you should have a separate and designated betting bank. Protect you from losses caused by inevitable losing runs. Stop you from going bust! Keep your staking nice and consistent. Help to maximize effectively how much profit you make during the good times. Help you keep a track on how much you are making overall! The good news is that setting up a betting bank is extremely simple and here at the Smart Betting Club we provide advice on doing just that for each tipster we review and report back upon. Most tipsters will advise staking in terms of ‘points’. This generally varies from 1 point up to 10 points. A Points Betting Bank will then tell you how much to stake in real £ (or euros, dollars – whatever your chosen currency) on each tip. E.g. If you have £1000 and follow a tipster using a 50-point betting bank, 1 point would equal £20. More on how to make this calculation later. For each tipster we monitor here at SBC, we calculate the optimal amount of points you need to assign into a betting bank. This protects you from losing runs, enhances winning runs, and keeps staking consistent over time. Each tipster stakes differently so this Points Betting Bank (PBB) is optimised for each individual service. This allows you to stake efficiently with the confidence that your Financial Betting Bank will not go bust. The PBB for each tipster should at the very least take into account the historical worst losing run for that service. A general rule of thumb is to double the previous longest losing run, so that should such a poor run happen again in the future, then no more than at worst 50% of any betting bank should be lost. To generate the Smart Betting Club’s own betting bank recommendations, we actually use a special in-house ‘betting bank simulator’ which comes up with a highly tuned figure for optimal returns. So as a member, you know we have your bank and back covered! Of course the amount of money you can actually make from following a tipster depends on the real-life Financial Betting Bank (FBB) you can apply to it. This refers to the amount of money you set aside to follow a service, when considering the Points Betting Bank. This FBB amount is related to the PBB as we will go on to demonstrate in the example below. This FBB amount should be an amount of money you feel comfortable risking in following a particular tipster. To show how the PBB and FBB come together, let me use a real life example as taken from a recent Tipster Profit Report. This example tipster is very profitable indeed, although as its identify is reserved for SBC members only, for the purposes of this email, l will call them ‘Top Racing Tips’. Our points betting bank recommendation for Top Racing Tips is 100 points. This figure takes into account historical losing runs, and the current method of staking that Top Racing Tips investments utilises. If following Top Racing Tips over the past 12 months this service would have made you 336.44 points profit to their advised staking. Let’s say we decide to follow Top Racing Tips with a FBB of £2,000 in real money. We then divide the FBB by the PBB to get our staking per point. 2000/100 = £20. Therefore £20 is our stake per point. As this tipster made 336.44 points over the past year, we multiply that by your stake of £20 over the past year. This particular tipster charges £135 per quarter or £450 for annual membership so even if deducting a full year’s subscription, you still would end up nicely in profit. Of course, you don’t need £2000 to follow this tipster. All of which just goes to show you don’t need to break the bank to get started betting for profit. After all, there is absolutely no harm in starting small with your betting and developing it as a platform for long-term success. You should never feel pressurised to instantly start making thousands of pounds in your first few months. Instead, simply allow the returns to gradually evolve over time. Many of the tipsters we recommend have been making their members money for several years, so there is no rush to make large sums quickly. If you are after professional guidance on the right betting banks to use – then the Smart Betting Club service can help you. Firstly, for every tipster we rate, review and recommend we provide a tailored Points Betting Bank recommendation. So you know exactly what you need to get started. We also provide more detailed advice on betting banks via the in-depth Pro Gambler Blueprint we supply to you as a new Smart Betting Club member, which provides everything you need to set up your betting properly. Part One: Solid Foundations – Avoid common newbie mistakes by getting your betting off on the right foot. Access to all of this and more is available the instant you join us at the Smart Betting Club. The very latest Smart Betting Club Magazine (Issue 102) is our now and contains special reviews of 4 very different, yet profitable tipsters with a track record of winning betting. Whether you are interested in Golf, Racing, Tennis or even anything that can make you a profit on, you will find something to suit you. The 4 tipsters cover all budgets (including 1 free expert) and offer solutions if betting with bookmakers or on the betting exchanges. Read our full independent review of the Golf Tipster with a 44% ROI since January 2016. Free 60 Day Trial Available! Check out our take on the affordably priced Saturday-only Racing Tipster with a very fair odds quoting policy. The little-known Tennis Guru with a 6% ROI & 51% strike-rate over 1066 tips. Exchange betting friendly. Interview and analysis of the free racing tipster up 28% ROI since 2014. One to follow! You can access your own copy of SBC 102 and our entire back catalogue of magazines the instant you join the Smart Betting Club. You can also enjoy significant discounts on the cost of joining many of these tipsters via our unique Tipster Discounts – exclusively available to SBC members only! 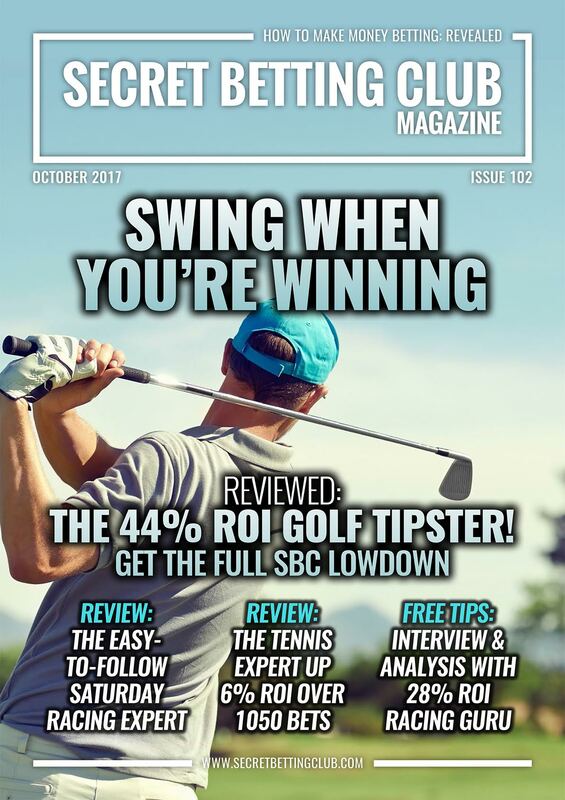 Including the 60 day exclusive FREE trial of the cover feature review service in SBC 102 – the Golf Tipster with a 44% ROI! Save Up To £38 & Enjoy The 90 Day Money Back Guarantee! Best of all, by joining today, you can also save up to £38 on the cost of a Smart Betting Club membership. We offer the 90 day money back guarantee as we are 100% confident that we can help you and your betting. This is based on our 11 years experience helping countless punters like you transform their betting.